Titan Forge puts up new Gravehaunt Hills zombie goblins (or "zomblins" as they call them). Why the heck not? 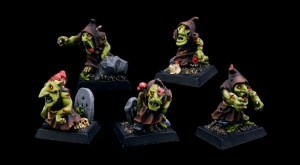 Resurrected by the lord of Gravehaunt Hills, Zomblins are a nice addition in the ranks of existing undead armies. Additionally, they don't panic in front of their enemies, what makes them even better than their living versions.